Ever wonder how we got here to this point? Take a look back at our Hangar Heritage to get an idea where the roots of our passion to build the Learjet 45 came from! William (Bill) Lear, the creator of the well known Learjet was more than just an aviation manufacturer, he was a world-renowned inventor. During his time, he had over one hundred patents to his credit, most notably the eight track tape player and the car stereo! By age 47, he had won the Collier Trophy award for his invention of the first autopilot known as the F5. Although he was not an aeronautical engineer, his ultimate dream was to design and build a jet aircraft suitable for business travel. The idea of the executive jet came to Bill Lear in the late 50’s when commercial aviation was beginning to fly faster, higher and farther than ever before. But for the business men in the executive world, they were still stuck in piston driven aircraft, flying in the clouds below the commercial airliners. This just did not seem right to Bill Lear so he decided to do something about it. In all actuality, it was Bill Lear Jr. who introduced the roots of the first Learjet to his father in Switzerland. Bill Jr. was working with a Swiss company and had an opportunity to fly the newly developed Swiss P-16 jet fighter which was being developed to replace the Swiss Air Forces Vampire and Venom aircraft. Bill Lear himself was equally impressed with the fundamental wing design to the point that he brought the idea back to the board of directors at Lear Inc., however, the idea was shot down. Bill Lear was so adamant about his dream that he resigned as chairman at Lear Incorporated and sold his portion of shares for a grand total of 12 million dollars to develop the new executive jet. In 1963, Bill Lear created a new company called Swiss American Aircraft Corporation (SAAC) in Switzerland. The future business jet would be known as the SAAC-23. Bill Lear was an impatient man and wanted things done sooner rather than later. 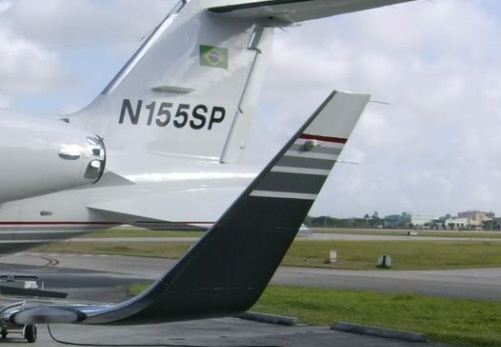 He wanted to be the first to develop and certify a small business jet. At the time, he was in a race with what was then known as the Aero Commander Company and their Jet Commander aircraft. He was not happy with the slow work ethic that the Swedish workers had adopted and was use to a 12 hour a day and six or seven day work week to get things done. Realizing that the slow pace of progress was not acceptable, within days, he decided to move all of his operations to Wichita Kansas in the United States and changed the name of the company to Lear Jet Corporation. A few months later, the prototype, now known as the Learjet Model 23, was nearly completed and ready for test flights! Because Bill Lear was quickly running out of money during the prototype phase of the project, he ordered that the tooling for the future production line of the Model 23 be completed at the same time, which of course was a risky move if in fact something had to be re-engineered. As it turns out, just weeks before the first test flight, his engineers brought to his attention that the cruciform style tail from the P-16 design was not going to work because of the jet blast from the side mounted engines. The “T” type tail would be used in it’s place and within a month, they were back on track. On October 7th 1963, the first Learjet Model 23-001 took off from Wichita Municipal airport for it’s maiden test flight. After the flight, the test pilot reported, “The flight had gone better than expected and I was expecting a good flight”. Bill Lear had did what others said could not be done. He developed, built and had a Learjet certified in less than two years with just $12 million. Experts at the time said that a project like this should have taken 10 years and $100 million. Because the tooling was completed during the prototype phase, production started immediately! The first Learjet 23-001 Tail number N801L was short lived. It crashed after takeoff at Wichita Municipal Airport at the end of runway 19 in a corn field during a test flight due to pilot error when they forgot to retract the spoilers. Believe it or not, both test pilots walked away and even 23-001 was for the most part undamaged with the exception of the landing gear being ripped off and a fuel leak. However, the fuel leak caught fire and the aircraft was destroyed. As it turns out, the first sale of a Learjet was to an insurance company! Unfortunately, the transition for some pilots from piston driven aircraft to jets proved to be too much. There were a few more crashes with fatalities that shortly followed, all ruled as pilot error with the exception of one in which an electrical problem was suspected. Did you know? 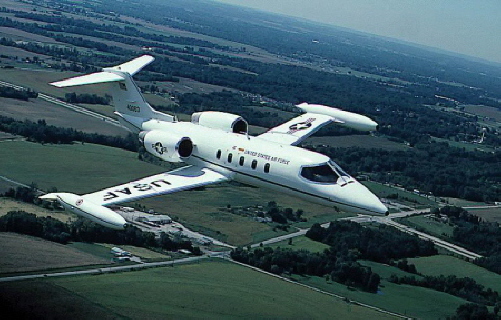 Special missions have been a part of the Learjet’s heritage almost from day one. In 1965, the first Learjet customer, Chemical and Industrial Corporation was called upon at a moments notice to pull the seating out and replace them with a stretcher. The mission was to pick up a NASA engineer suffering from a medical emergency from Cape Kennedy Florida and transport him to Cleveland Ohio which they did in time successfully. Still today, Learjets are used frequently as Medivac or Air Ambulances because of their speed and ability to fly up to 30,000′ with a cabin pressure of sea level. This was especially important for patients who just had surgery. Over the next few years, sales of the new Learjets were going very well until the recession of 1966 hit. Corporate transportation was one of the first things that suffered as sales of the executive jets literally came to a halt. Stock in Lear Jet Corporation fell to just $8.50 per share from a high of $82 and Bill Lear was forced to put the company up for sale in hopes to attract a buyer in order to keep the business afloat. Harry Combs of Combs Aviation informed the chairman of Gates Rubber Company, Charles Gates of the opportunity to buy Learjet at a bargain. Charles Gates had the passion for aviation and the capital available to quickly over take Lear Jet Incorporated. 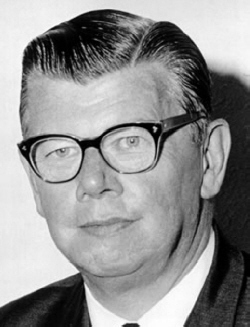 Under the new company name, Gates Learjet Corporation, Bill Lear stayed on as Chairman of the board for another two years until he resigned in 1968. Bill Lear passed away on May 14th 1978. 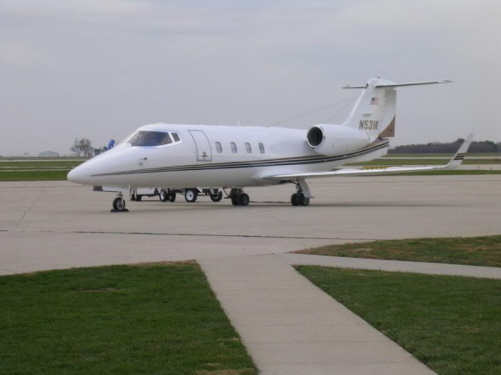 During the late 60’s and early 70’s under Charles Gates, the Learjet was improved on in many different ways, primarily performance enhancements and creating more room by stretching the cabin. These changes created several different variations of the Model 23/24/25/28/29, all of which used the General Electric CJ-610 turbojet engine. Models 35/36 concept began as the Learjet 25BGF “Garrett Fan” a Model 25 with a then-new TFE731 turbofan engine mounted on the left side in place of the 25’s General Electric CJ610 turbojet engine. This test bed aircraft first flew in May, 1971. The first flight of the Model 35 prototype came on August 22nd 1973 and FAA certification in July, 1974. 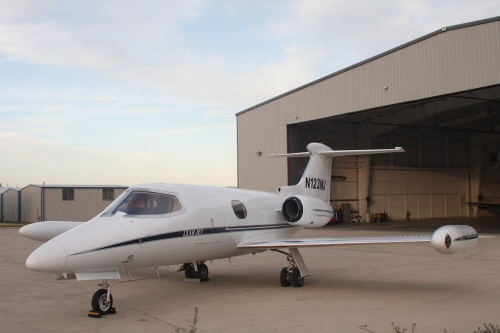 As a result of the increased power and reduced noise of the new engine, Learjet further improved the design and instead of being simply a variant of the Learjet 25, it became its own model, the 35. With a more fuel efficient engine, the Garret TFE731-2 and the availability of thrust reversers, the Model 35 and 36 had an increased range but were never certified to fly above 45,000. The Model 35 was 13 inches longer than its predecessor, the Model 25 and could carry up to eight passengers. There were 64 base-model 35s built before the Model 35A replaced it in 1976. The Model 35A was an upgrade with TFE731-2-2B engines and a range of 2,789 miles with a fuel capacity of 931 US gallons (3,524 L). Refueling was accomplished at ground level through each wingtip tank. Over 600 Model 35As were built with production ending in 1993. The USAF purchased eighty Model 35A which were designated as the C-21A. The C-21A are primarily used for VIP transport and transition-training roles. It was this large government purchase that helped keep Learjet from going under during the slow down of sales in the early 80’s. Did you know? Thrust reversers are used to help slow the aircraft down after touch down during the roll out. When the thrust reversers are deployed, they create a wall of air that slows the aircraft down to reduce the wear on the braking system. The winglets for the model 55 and as a matter of fact, every Learjet thereafter, were secretly developed on a Model 28 prototype to the point that while the aircraft was on the ground between test flights, dummy tip tanks were placed over the wiglets to hide them until they were revealed in 1977 at the NBAA, (National Business Aircraft Association) convention in Houston Texas. NASA got involved with the development using wind tunnel experiments and found that the winglets reduced drag, increased lift, increased range by as much as 6% and even improved directional stability. Because of this innovation you can’t go to your local airport and find a modern day jetliner without a set of winglets! The Learjet 50 series was first announced at the 1977 Paris Airshow with larger cabins than the existing Learjets. 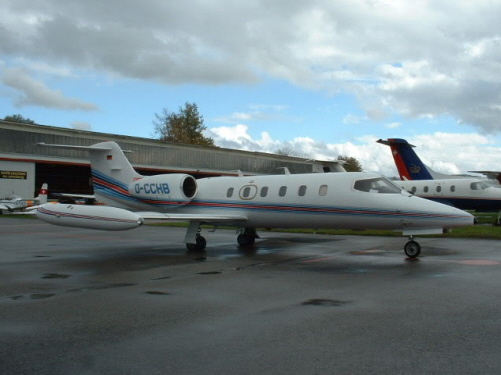 The series was to have three variants, the Learjet 54, 55 and 56 but only the Learjet 55 was built. The Model 55 was to be the companies first mid size executive jet, nicknamed the “Longhorn” because of it’s winglets in place of the tip tanks. The model 55 first flew in 1979 and was certified in 1981. The Model 55 was the first Learjet that had stand up room and a full airline style lavatory at the aft of the cabin. 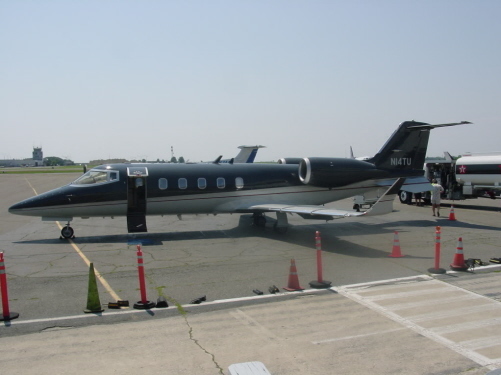 Because of it’s higher gross weight (21,250 lb), making it the heaviest Learjet at the time, it needed the more powerful Garret TFE731-3 engines. Did you know? 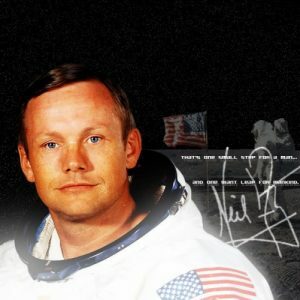 It’s not quite the moon but it is certainly worth noting, in 1979 at Kitty Hawk North Carolina, Neil Armstrong was at the controls of a Lear 28 and took it to 15,000 meters (49,215ft) in 12 minutes 26 seconds. This particular flight set five world records! The Model 31A was developed during one of the low points in the history of the Learjet legacy. Believe it or not, the 31A was developed behind the scene by the engineers at Gates Learjet in hopes to take the very best technology, ideas and parts from previous models in order to create the best handling executive jet at the time, however, this was in defiance of Charles Gates wishes! Gates did not want to spend time or money on the development of a new and improved model because the company was in financial trouble and was looking to be acquired by a LBO. 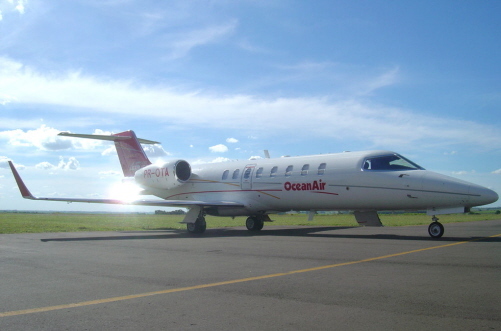 However, after the 31A’s first test flight, it was clear that the Learjet had finally been tamed and was finally able to loose it’s reputation of being a “hot aircraft”. One of the items that helped enable the Model 31 to approach at lower speeds at landings was the addition of the Delta fins. Did you know? The early Learjets had horrible stall characteristics and the aircrafts had to have a stick pusher installed to force the control columns forward to alleviate the stall condition, otherwise, the plane would continue to enter into a deep stall and complete loss of controls would come next. The Delta fins fixed that problem by creating lift if the aircraft was approaching a stall condition which in turn pushed the nose of the aircraft back down so that the plane would start flying again. This enabled the aircraft to approach at slower speeds during landings. Several Learjets found their way into military service. Most of these were photo reconnaissance or sea patrol aircraft. Finland purchased three 35/36A for Sea Patrol and they were equipped with Anti Submarine Warfare equipment! During the Falkland war of 1982 between the British and Argentina, the Learjet 36A saw action when the Argentine Air Force operated four 36A’s as photo reconnaissance. On their first mission, they successfully located the British Destroyer HMS Coventry. Later that same day, Argentine bombers sank that destroyer. Two weeks later, the Recon squadron went on another aerial photo mission, but this time a Sea Dart Missile from the British Destroyer HMS Exeter shot down one of the Lear 36A designated as T-23. A few days later the conflict ended. Singapore Airlines’ most unusual role for the Learjet 31 was when it used the Lear’s flight deck as a practical flight trainer. 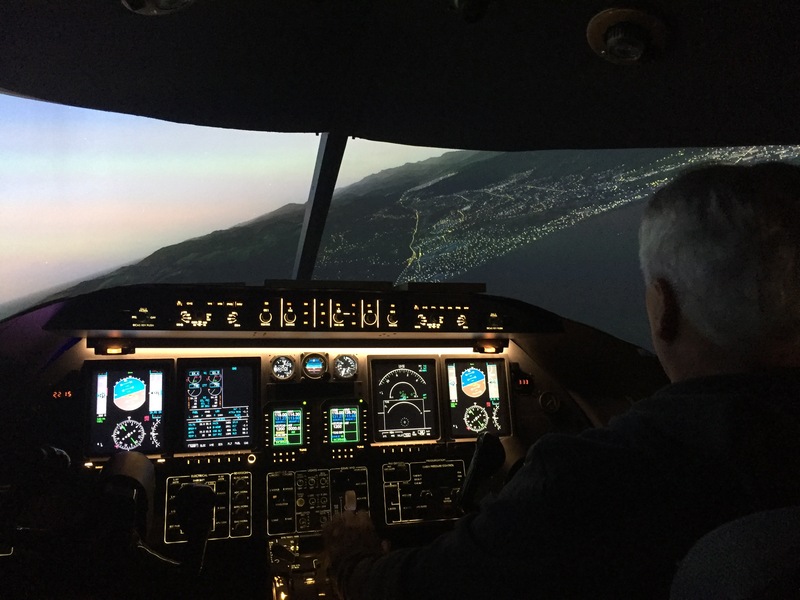 The cockpits were converted to mimic Boeing 747-400 and Airbus A310 flight decks to train their pilots at a fraction of the cost. By 1990, the Learjet aircraft had changed company hands a few more times and was now owned by Bombardier Inc. The plan to produce a new mid size Model 60 was announced to be the predecessor of the model 55. Airframe 55-001 was used as the prototype for the 60 and was cut in half and a two foot plug was inserted. The tail section was also stretched by 15 inches in order to balance out the aircraft. Bombardier had full intentions to use the Garret TFE731-5 engines on the Model 60, however, the Pratt & Whitney PW305A had just come on line and was more powerful with better fuel efficiency, making the Model 60 the only Learjet to date to use them. For the first time in the history of the Learjet, an executive jet was redesigned from the ground up using all new Computer aided drawings (CAD) and implemented all new parts. The Model 45 was now the second Learjet built under Bombardier but this one was completely designed in CAD. More than 80% of the major airframe parts were automatically manufactured with numerically controlled milling (CNC). During the prototype phase, only 1.3% of the parts made were rejected compared to earlier Model rejection rates of up to 20%. The model 45 was outfitted with a Honeywell Primus 1000 suite and utilized what is known as a “dark cockpit”, meaning no annunciations are on when all systems are normal. A pair of Garret TFE731-20 jet engines are used, the quietest and most efficient power plant used in a Learjet to date! Did you know? Only the nose landing gear components were salvaged from the Model 31 and used on the new Model 45. 100% of all the other parts were completely redesigned for the new Learjet! The Learjet 85 was a Learjet development program by aircraft manufacturer Bombardier Aerospace. 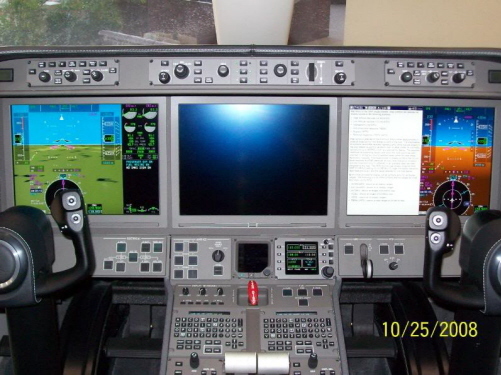 The program was launched on October 30th, 2007 and a mock up of the aircraft was unveiled in October 2008 at the NBAA show in Orlando. Win tunnel testing was complete in the summer of 2010. 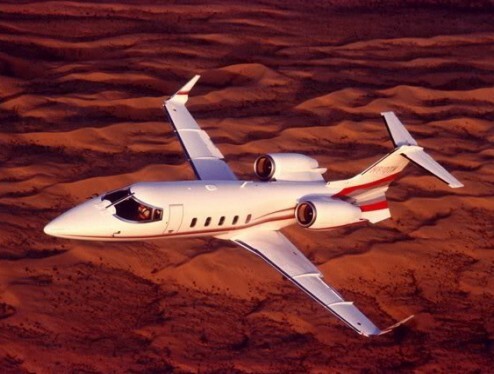 The Learjet 85 was to fit between the midsize and the super midsize segments of the market and to replace the Model 45. Designed for type certification under FAR-25, it was the first Bombardier Aerospace business jet to feature a composite structure. The plane was intended to have a high-speed cruise of Mach 0.82 and a transcontinental range of up to 3,000 nautical miles (5,600 km), an increased range over the Model 45 by more than 50%. One of the other features that the Model 85 will have (if ever released) is an “All Glass Cockpit”, which makes for a very friendly flight crew environment! On January 15th, 2015, Bombardier announced their decision to suspend the Learjet 85 program and cut 1000 associated jobs. On October 29, 2015, Bombardier chief executive Alain Bellemare announced a 2015 $4.9 billion third quarter loss, including the cancellation of the Model 85 program. Although the road for the Learjet has been bumpy and uncertain at times, in the end, Bill Lear accomplished what he had set out to do. Certainly a product has reached a special status in the world when every small jet seen flying in the skies above is referred to by the average person on the street as a “Learjet”! Here is a brief video documenting the history and description of the Learjet 45! WARNING: The information found on this website is only suitable for Hobby Flight Simulation and flight simulator enthusiast! In most cases the information found here is outdated and SHALL NOT be used for Real World Aviation or real world references!